A national campaign to recruit 500 customer advisors was launched in France in June. Fifty of them will be recruited in Toulouse and its inner suburbs. 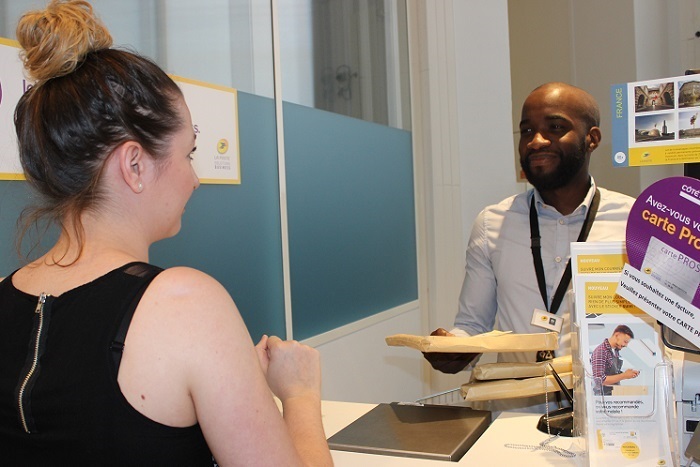 “Positive, agile, close” – essential qualities for the daily work of customer advisors at La Poste. In June, La Poste launched a nationwide campaign to recruit 500 male and female customer advisors. It particularly harnessed social networks and job search sites. With the prospect of numerous customer advisors retiring over the next few years, the DEX in south-west France aims to recruit 50 new customer advisors for the post offices of Toulouse and its surrounding area. As part of implementation of the service development and quality policy, customer advisors are the first point of contact for private and professional customers in post offices. Their responsibilities include welcoming customers and providing them with support and information on all the service on offer. They are business introducers for banking advisors and professional business managers. They identify the service required, propose a suitable solution and assist the customers with their purchases, among other duties. It is essential to have the essential qualities for this job, including a sense of service, availability, friendliness, discipline, adaptability and teamwork. To apply for the position of customer advisor, you must two years of higher education in banking, insurance, business or commercial management and have basic experience in a face-to-face customer relations role. Rivelino Mamengi is a customer advisor at the post office of Toulouse Saint-Aubin (Haute-Garonne). Rivelino Mamengi is a customer advisor at the post office of Toulouse Saint-Aubin (Haute-Garonne). After various roles in the private sector and temporary jobs at La Poste as a customer advisor, he chose to join La Poste by responding to a recruitment campaign. Rivelino Mamengi, customer advisor at La Poste Toulouse Saint-Aubin, discusses his background and career leading up to joining La Poste as a customer advisor. Rivelino Mamengi: I was always been attracted to marketing, communications and business. I also have a BAC STG* and I started a BTS NRC**. While I was studying, I always had part-time jobs linked to retail. I did some prospecting for American Express and a subcontractor of SFR. That last experience is useful to me today in my job as a customer advisor with a telephony component. How did you become a customer advisor at La Poste? R.M. : I was looking for jobs and Pôle Emploi (the job centre) contacted me for a one-week internship. At the end of that internship, Adecco offered me an assignment at La Poste as customer advisor. I then carried out several assignments at various sites in Haute-Garonne, including for a long period, still on a temporary basis, at Toulouse Saint-Aubin. It went really well. I then worked at La Banque Populaire. But when I learned that La Poste was recruiting customer advisors and I immediately submitted an application online. R.M. : This job is intense and varied. It covers mail, telephony and banking activities. In addition, I am attached to La Poste as a company, as it offers important career prospects. Today, I wish to move towards a banking advisor role, which is why I have enrolled on the “Ambition Cofi” course. What are the qualities necessary to work in this profession? R.M. : Above all, it is necessary to have good interpersonal skills, to dare to approach others. To listen to customers to identify their needs and expectations. To know how to inform and teach them, which requires being a good communicator and mastering the products and services. It also requires being at ease with sales, knowing how to argue, persuade and convince. It is also necessary to be patient and calm when faced with tricky, tense situations. And finally, it is essential to remain professional, especially in relation to compliance with regulations, regardless of the situation you are in. Samira Hadj Ali, customer advisor at La Poste in Toulouse Minimes, discusses her background and her profession. After several temporary assignments as a customer advisor, Samira Hadj Ali chose to apply during the recruitment campaign for customer advisors in July 2017. She looks back on her career and her views on the profession. Samira Hadj Ali: After a degree in sociology, I started a master's degree before putting my studies on hold. In 2012, I became interested in La Poste and I applied for an observation internship, via the Pôle Emploi, at La Poste in Toulouse Capitole, to lean about the jobs of cashier and banking advisor. That internship confirmed my ambition to join La Poste. When did you join La Poste? S.H.A. : From 2014, I was given several long-term assignments as a customer advisor, on a temporary basis via Adecco. They confirmed to me that I liked this job. Then, in July 2017, I learned during my parental leave that La Poste was recruiting and so I immediately applied. How were you recruited as a customer advisor? S.H.A. : I submitted an application online, comprising a CV and covering letter. I then took written tests and an interview and was accepted. S.H.A. : I had two months of training – theoretical training followed by practical on-the-job training. Although I had already worked in the job, I needed a refresher as the processes and tools evolve very quickly. At the end of the course, last January, I was appointed to La Poste in Toulouse Minimes. S.H.A. : I would say its diversity, because we work in the Mail-Parcels business line as well as banking and telephony. Initially, I didn’t have a sales background, but it was a real revelation for me. My sociology studies are useful in managing customer relations, however. And what are the qualities necessary for the job? S.H.A. : We need to listen to customers and take an open-minded approach in order to find a solution to their needs. It is important to have good interpersonal skills and to be responsive. With the internet, customer purchasing habits are evolving – they want everything straight away. You also have to be a good teacher, as well as knowing how to work in a team.